On the era of systematic reviews: Should we put our hands up? Should we choose a side? Materials and methods: Two hundred patients with any type of edentulism (single tooth, partial and total edentulism) requiring one implant-supported prosthesis were randomly allocated in two equal groups to receive either implants with an external connection (EC) or implants of the same type but with an internal connection (IC) (EZ Plus, MegaGen Implant, Gyeongbuk, South Korea) at seven centres. Due to slight differences in implant design/components, IC implants were platform switched while EC were not. Patients were followed for 1 year after initial loading. Outcome measures were prosthesis/implant failures, any complication, marginal bone level changes and clinician preference assessed by blinded outcome assessors. Results: One hundred and two patients received 173 EC implants and 98 patients received 154 IC implants. Six patients dropped out with 11 EC implants and 3 patients with four IC implants, but all remaining patients were followed up to 1-year post-loading. Two centres did not provide any periapical radiographs. Two prostheses supported by EC implants and one supported by IC implants failed (P = 1.000, difference = -0.01, 95% CI: -0.05 to 0.04). Three EC implants failed in 3 patients versus two IC implants in 1 patient (P = 0.6227, difference = -0.02, 95% CI: -0.07 to 0.03). EC implants were affected by nine complications in 9 patients versus six complications of IC implants in 6 patients (P = 0.5988, difference = -0.02, 95% CI: -0.10 to 0.06). There were no statistically significant differences for prosthesis/implant failures and complications between the implant systems. One year after loading, there were no statistically significant differences in marginal bone level changes between the two groups (difference = 0.24, 95% CI: -0.01 to 0.50, P = 0.0629) and both groups lost bone from implant placement in a statistically significant manner: 0.98 mm for the EC implants and 0.85 mm for the IC implants. Five operators had no preference and two preferred IC implants. Conclusions: Within the limitations given by the difference in neck design and platform switching between EC and IC implants, preliminary short-term data (1-year post-loading) did not show any statistically significant differences between the two connection types, therefore clinicians could choose whichever one they preferred. Purpose: To compare the effectiveness of immediate post-extractive single implants with delayed implants, placed in preserved sockets after 4 months of healing. Implants that achieved an insertion torque of at least 35 Ncm were immediately non-occlusally loaded. 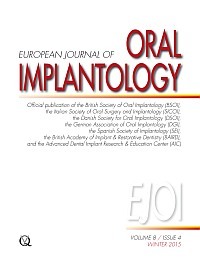 Materials and methods: Just after tooth extraction, and in the presence of less than 4 mm of vertical loss of the buccal bone in relation to the palatal wall, 106 patients requiring a single immediate post-extractive implant in the maxilla from second to second premolar were randomly allocated to immediate implant placement (immediate group; 54 patients) or to socket preservation using anorganic bovine bone covered by a resorbable collagen barrier (delayed group; 52 patients), according to a parallel group design at three different centres. Bone-to-implant gaps were to be filled with anorganic bovine bone, however this was not carried out in 17 patients (corresponding to 40% of those who should have been grafted). Four months after socket preservation, delayed implants were placed. Implants inserted with an insertion torque of at least 35 Ncm were immediately loaded with non-occluding provisional single crowns, then replaced after 4 months by definitive crowns. Patients were followed up to 1 year after loading. Outcome measures were implant failures, complications, aesthetics assessed using the pink esthetic score (PES), peri-implant marginal bone level changes and patient satisfaction recorded by blinded assessors. Results: Nineteen (35%) implants were not immediately loaded in the immediate group versus 39 (75%) implants in the delayed placement group because an insertion torque superior to 35 Ncm could not be obtained. Six patients dropped out 4 months after loading from the delayed group versus none in the immediate group. Two implants failed in the immediate group (6%) versus none in the delayed group, with the difference showing no statistical significance (difference in proportions = 0.04; 95% CI: -0.03 to 0.11; P = 0.187). Eight minor complications occurred in the immediate group and one in the delayed group, and this was statistically significant (difference in proportions = 0.13; 95% CI: 0.03 to 0.23; P = 0.028). At delivery of definitive crowns, 4 months after loading, the mean aesthetic score was 12.8 and 12.6 in the immediate and delayed groups, respectively. At 1 year after loading, the mean aesthetic score was 13.0 and 12.8 in the immediate and delayed groups, respectively. There was no statistically significant difference at 4 months (P = 0.500) and at 1 year (P = 0.615). Marginal bone levels at implant insertion (after bone grafting) were 0.10 mm for immediate implants and 0.02 mm for delayed implants, which did not have a statistically significantly difference (mean difference = 0.08; 95% CI: 0.04 to 0.12; P < 0.001). One year after loading, patients of the immediate group lost on average 0.23 mm and those in the delayed group lost 0.29 mm, the difference being statistically significant (mean difference = -0.06; 95% CI: -0.11 to -0.01; P = 0.036). Patients of both groups were equally satisfied at 4 months as well as at 1 year after loading. Conclusions: There are more complications with immediate post-extractive implants in comparison to delayed implants. It seems more difficult to obtain an implant insertion torque superior to 35 Ncm in sockets preserved with anorganic bovine bone after a 4-month healing period than with postextractive sites. The aesthetic outcome appears to be similar for both groups. Purpose: To compare the effectiveness of immediate post-extractive single implants with delayed implants placed in preserved sockets after 4 months of healing. Implants that achieved an insertion torque of at least 35 Ncm were immediately non-occlusally loaded. Materials and methods: Just after tooth extraction, and in the presence of less than 4 mm of vertical loss of the buccal bone in relation to the palatal wall, 50 patients requiring a single immediate post-extractive implant in the maxilla from second to second premolar were randomly allocated for either immediate implant placement (immediate group; 25 patients) or for socket preservation using an algae-derived (phycogenic) bone substitute, covered by a resorbable collagen barrier (delayed group; 25 patients), according to a parallel group design in one centre. Bone-to-implant gaps were filled with an algae-derived bone substitute. Four months after socket preservation, delayed implants were placed. Implants inserted with an insertion torque of at least 35 Ncm were immediately loaded with non-occluding provisional single crowns, then replaced, after 4 months, by definitive crowns. Patients were followed up to 1 year after loading. Outcome measures were implant failures, complications, aesthetics assessed using the pink esthetic score (PES), peri-implant marginal bone level changes and patient satisfaction, recorded by blinded assessors. Results: Nine (36%) implants were not immediately loaded in the immediate group versus 19 (76%) implants in the delayed placement group, because an insertion torque superior to 35 Ncm could not be obtained, the difference being statistically significant (difference = - 0.40, 95% CI: -0.652 to -0.148, P = 0.010). Two patients dropped out 4 months after loading in the delayed group versus none in the immediate group. Two implants failed in the immediate group (8%) versus none in the delayed group, with the difference showing no statistical significance (considering 25 and 23 patients, the difference in proportions was 8% favouring the delayed group, 95% CI: -8.4 to 26.0, P = 0.490). Three minor complications occurred in the immediate group and two in the delayed group, and this was not statistically significant (considering 25 and 23 patients, the difference in proportions was 3.3% favouring the delayed group, 95% CI: -18.2 to 24.0, P = 1.000). At delivery of definitive crowns, 4 months after loading, the mean aesthetic score was 12.42 and 12.28 in the immediate and delayed groups, respectively. At 1 year after loading, the mean aesthetic score was 12.78 and 12.22 in the immediate and delayed groups, respectively. There were no statistically significant differences at 4 months (P = 0.666) and at 1 year (P = 0.090). Marginal bone levels at implant insertion (after bone grafting) were 0.01 mm for immediate and 0.06 mm for delayed implants, which showed a statistically significant difference (mean difference = - 0.04; 95% CI: -0.08 to -0.01; P = 0.009). One year after loading, patients of the immediate group lost on average 0.13 mm marginal bone and those in the delayed group lost 0.19 mm, however the difference was not statistically significant (mean difference = 0.05; 95% CI: -0.002 to 0.110; P = 0.06). All patients were fully satisfied, both for function and aesthetics, and would undergo the same procedure again at 4 months as well as at 1 year after loading. Conclusions: No significant differences were observed between the two procedures, although the only two implant failures were for immediate post-extractive implants. It seems more difficult to obtain an implant insertion torque superior to 35 Ncm in sockets preserved with algae-derived bone substitute after a 4-month healing period than at immediate post-extractive sites. Purpose: To evaluate the efficacy of short (5 or 6 mm-long) dental implants versus 10 mm or longer implants placed in crestally-lifted sinuses. Materials and methods: Twenty partially edentulous patients having 5 to 7 mm of residual crestal height and at least 7 mm thickness below the maxillary sinuses as measured on computerised tomography scans were randomised according to a parallel group design to receive either one to two 5 or 6 mm-long implants (10 patients) or 10 mm-long implants (10 patients) after crestal sinus lifting and grafting with anorganic bovine bone (Endobon). Implants were left to heal submerged for 4 months and loaded with reinforced acrylic provisional prostheses, and then replaced after 4 months, by definitive provisionally cemented or screw-retained metal-ceramic or metal-resin prostheses. Outcome measures were prosthesis and implant failures, any complications, radiographic peri-implant marginal bone level changes and patient's satisfaction assessed by blinded assessors, when possible. All patients were followed up to 1 year after loading. Results: No patient dropped out, no failures or complications occurred. Short implants lost 0.70 ± 0.19 mm of peri-implant marginal bone and long implants lost 0.87 ± 0.21 mm of periimplant marginal bone 1 year after loading, the difference between the two groups showing no statistical significance (difference = -0.17 mm; 95% CI: -0.35 to 0.02; P = 0.078). Conclusions: Both techniques achieved excellent results and no differences were observed between prostheses supported by one to two implants, 5 to 6 mm-long or 10 mm-long in the posterior atrophic maxillae up to 1-year after loading, therefore it is up to the clinicians to decide which procedure to use, although longer follow-ups are needed to understand if one of these procedures could be more effective in the long-term. Purpose: To compare the effectiveness of immediately loaded total prostheses supported by implants with a roughened surface versus implants with a machined/turned surface. Materials and methods: Fifty edentulous or to-be-rendered edentulous patients requiring an implant-supported cross-arch prosthesis, were randomised either to receive four to eight implants with a roughened surface (25 patients) or with a machined/turned surface (25 patients). Provisional metal-reinforced acrylic prostheses were delivered 48 h after implant placement. Provisional prostheses were replaced after 4 months, by definitive screw-retained metal-resin cross-arch restorations. Outcome measures were prosthesis and implant failures, any complications and peri-implant marginal bone level changes. Patients were followed 1 year after loading. Results: One year after loading no patient dropped out. No prosthesis failed, but two machined implants were found to be mobile at definitive impression taking in 1 patient (Fisher's exact test: P = 0.312; difference in proportions = 4%; 95% Cl: -10 to 18). No complications occurred. Both groups presented a significant peri-implant marginal bone loss at 1 year after loading (P < 0.0001), -0.64 ± 0.20 mm for rough implants and -0.68 ± 0.23 mm for turned implants, respectively, with no statistically significant differences between the two groups (P = 0.482; mean difference = 0.04 mm; 95% Cl: -0.17 to 0.25). Conclusions: Up to 1 year after immediate loading, both implant surfaces provided good and similar results, however, the only two implants which failed early in the same patient had a machined surface. These preliminary results must be confirmed by larger trials with longer follow-ups. Purpose: To propose a method to measure the esthetics of the smile and to report its validation by means of an intra-rater and inter-rater agreement analysis. Materials and methods: Ten variables were chosen as determinants for the esthetics of a smile: smile line and facial midline, tooth alignment, tooth deformity, tooth dischromy, gingival dischromy, gingival recession, gingival excess, gingival scars and diastema/missing papillae. One examiner consecutively selected seventy smile pictures, which were in the frontal view. Ten examiners, with different levels of clinical experience and specialties, applied the proposed assessment method twice on the selected pictures, independently and blindly. Intraclass correlation coefficient (ICC) and Fleiss' kappa) statistics were performed to analyse the intra-rater and inter-rater agreement. Results: Considering the cumulative assessment of the Smile Esthetic Index (SEI), the ICC value for the inter-rater agreement of the 10 examiners was 0.62 (95% CI: 0.51 to 0.72), representing a substantial agreement. Intra-rater agreement ranged from 0.86 to 0.99. Inter-rater agreement (Fleiss' kappa statistics) calculated for each variable ranged from 0.17 to 0.75. Conclusion: The SEI was a reproducible method, to assess the esthetic component of the smile, useful for the diagnostic phase and for setting appropriate treatment plans. Purpose: To report a rare and dramatic complication following immediate dental implant placement in a heavy smoker, who had a delayed diagnosis of uncontrolled diabetes. Materials and methods: In this case report we present the dramatic course of a 64-year old female patient treated with five immediate post-extractive dental implants in the mandible, who developed osteomyelitis, which manifested initially as local peri-implant inflammation and progressed into a spontaneous jaw fracture, despite repeated surgical interventions and antibiotic courses over a 3-year period, until diabetes was diagnosed. Results: A symptom-free status could be achieved only after partial mandibulectomy, treatment of diabetes and reconstruction with a microvascular fibula free flap. Conclusion: In the presence of mandibular osteomyelitis refractory to therapy, yet undiagnosed underlying pathologies, such as diabetes, should be investigated and treated urgently.